NEWLY installed GlobalPort interim coach Eric Gonzales has denied insinuations that team owner Mikee Romero is pressing him to win Batang Pier’s last two assignments if he is to remain in the position. “Pero syempre, natural naman na you have to perform your duties. Kung natalo kami kanina, ganun talaga. we have to learn and improve,” he added shortly after leading Globalport to an astounding 97-77 win over crowd favorite Barangay Ginebra in his debut. Until he was surprisingly appointed by Romero, Gonzales was largely unknown in the pro league. An assistant coach for most of his life, the former University of Santo Tomas track and field star claimed he, too, was surprised by his sudden ascent to a head coaching job. “Maski ako nagulat rin eh. But I know I need to be responsible, lalo pa may sinasabing command responsibility,” he said. Gonzales has learned advanced basketball coaching knowledge through his regular participation in Gospel-oriented Athletes in Action events, the last one being just this August with Morris Michalski. Gonzales also used to be an understudy of Bong Ramos, Binky Favis and Nash Racela in different leagues. 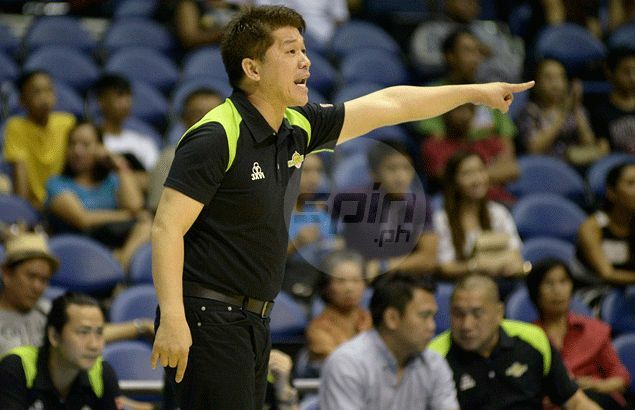 The former FEU assistant coach said he is leaving everything to God, especially his tenure at GlobalPort. “Bahala na ang Diyos saka si Boss (Mikee) dun,” he said. A source told Spin.ph that Romero was happy with how Gonzales made all the right calls in GlobalPort's manhandling of Ginebra. “Natuwa si Boss. Saka nakakita siya ng positive kay Eric. Kung paano mag ikot ng tao, mag-motivate ng players. May ipapakita eh,” said the source who asked that he not be named. In dismantling Ginebra, GlobalPort displayed superb team play that took advantage of the players' athleticism in a fast-paced offense. The Batang Pier's suffocating defense also caught their rivals flat-footed. Asked about the transformation, Gonzales refused to take all the credit. “Pareho lang ng dati 'yun (kay coach Pido). We just emphasized to pressure (on defense) para maging uncomfortable yung Ginebra,” he said. GlobalPort forward Yancy De Ocampo praised Gonzales' motivational skills, saying the youthful mentor would often accompany them to the scorer’s table whispering positive words before sending them to battle. “Parang anak ang trato niya sa amin, bago niya kami ipasok. Aakbayan niya kami tapos bibigyan ng paalala at pointers sa laro,” said De Ocampo. “Iba rin kasi yung ganun eh. Kasi intense siya eh. Detailed magsalita at full of motivation. Saka kina-klaro niya talaga ang dapat mong gawin at wag gawin sa court,” he added. De Ocampo also praised how Gonzales was able to use all of the players. “Yun ang maganda sa kanya. Kasi nabibigyan ng pag-asa ang mga players na makapagpakita. Kumbaga, kada game, kahit yung mga bangko, may i-expect na playing time. Kaya kumpiyansa ka,” added the 12-year PBA veteran. Globalport star guard Keith Jensen said that this early he is already happy with how Gonzales is handling the time. “It’s too early still but we have a lot of confidence in him,” said Jensen, who starred in Globalport’s win over Ginebra. Jensen, a former back-up guard at Ginebra, claimed that Gonzales’ up-tempo style and knack for full-court pressure give all of the players in the roster the chance to play. “Very up tempo, he likes to press and he likes to get fresh legs in. He’s very positive always,” said Jensen. “His style (of regularly rotating players) gives all the players something to look forward to every game. And we’re lucky to have a very talented team as a lot of guys can contribute,” he added.